Leading Manufacturer of gearbox oil, industrial gear oil, automotive gear oil, gear oil, synthetic gear oil and gear lubricants from Chennai. Being a client-centric company, we are engaged in providing Gearbox Oil to the clients. Gearbox Oil is recommended for use in bow thruster drive legs, anchor windlass gearboxes and outboard motor drive legs if compliant with the manufacturer's specifications. This product contains additives which offer full protection against wear and tear, as well as metal to metal contact which may occur under extreme loadings. Offered range has excellent anti corrosion properties and resistance to ageing. Our organization is widely recognized for its ability to offer Industrial Gear Oil of best quality and range to our clients. Free from all types of defects; Gear Oil is resistant to unknown factors and has optimum viscosity. It could easily be applied in machineries and is able to withstand effects of high temperature and moisture with ease. We have tested our entire range completely before delivering it to our client base. The expertise of our organization lies in offering Automotive Gear Oil to our clients. It has precise composition and is formulated in unique manner at our state of art center. It is widely used in automobile industries and is available in excellent quality range. It is resistant to moisture and other effects. Being quality oriented organization; we assure timely delivery of Automotive Gear Oil to our clients. 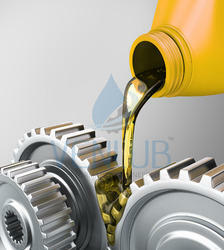 Gear Oil are extreme pressure type industrial gear lubricants. These oils demonstrate improved thermal stability and oxidation resistance over conventional lead-naphthenate oils. They have good demulsibility characteristics, low foaming tendency and provide rust and corrosion protection to metal surfaces. With sincere efforts of our professionals, we are offering premium grade Gear Oil Synthetic. This oil is checked under stern company parameters to ensure its quality which eventually helps in assuring customer gratifications. Demand for our offered automobile oil has increased for its remarkable properties like purity, thermal stability, effectiveness, eco-friendliness and premium quality. The offered oil is made available in numerous customized packaging options in order to ensure its safe transit. We are engaged in offering our valued clients supreme quality Gear Lubricants. The offered lubricant is processed using quality approved chemical compounds in compliance with international quality standards at advanced processing unit under the strict supervision of skilled professionals at vendors end. Clients can avail this lubricant from us at affordable prices.